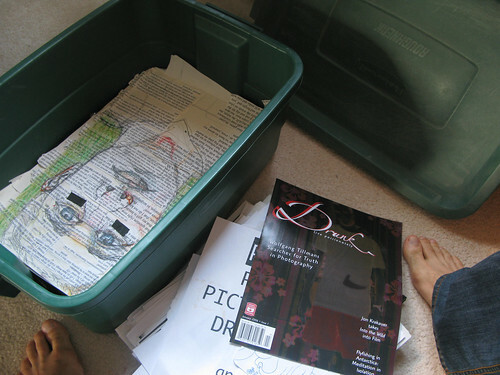 I discovered a container full of my old writing, drawings, and a variety of other things! so that I could run my speakers through it. I know, funny, right? Speakers but no stereo. I can’t even begin to describe how much I love music, how important it is to me, to my happiness, to my survival, to my inspiration. Well, today, as I was cycling home, I noticed a neighbour having a yard sale. and returned home all smiles. Now the work to be done! I decided to place the amp under my desk, to be close to my surge-protected power bar. In order to make room for it, I pulled out a shallow rubbermaid bin. I thought it’d be a good size to set the amp on. But before I placed it there, I wanted to know what was inside that bin. I believe I may have put it under my desk when I moved in here almost 2 years ago. And I don’t think I’ve touched it since. magazine clippings of cute girls or cool graphic design. And writing that just makes me chuckle and shiver at the same time. I chuckle because when I find these writings, I realize how little I’ve changed. I shiver because, goddamn it, these writings remind me how little I’ve changed. I’ve tried boxing, weights, running. Currently, I’ve found great satisfaction from yoga, and am trying to practice it as often as possible. (Hallelujah! This has not changed, and thank god. (how true! Well, I can actually say that I accomplished this one! Through school, both SFU and Langara, as well as working full time for ShowMakers for almost 4 years, I’ve been on a computer nearly every waking moment of my days. I challenged myself in the early stages, to type with my fingers in the correct positions (rather than chicken peck). (ah yes, here is where I shiver a little – because I haven’t been respecting this knowledge like I should be. The days I take time out for myself, I am happier, calmer, more focused. I know this, but I forget it so easily. There are always things to be done! My ideas! My art! So much to be done! But when all I do is do, I burn out. Or lose focus. Or get depressed. (okay, yes, this is lofty, to learn something new everyday. Yet maybe it isn’t, because aren’t we learning everyday? Each day is never exactly the same as the last, even if it feels that way. I must say: I tried Polish, took some night classes shortly after writing this, and it was really really tough. Even the instructor, a nice Poland-born lady, admitted to us that Polish is a very difficult language to learn. Do you know that every noun has 7 different ways to say it? That even your name has 7 variations, depending on the circumstances in which it is said? And that one of those is when your name is being shouted? That’s one thing I found. Maybe I’ll write about others. It’s fascinating stuff to me. keeping me in THE MOMENT. I was feeling pretty overwhelmed when I started going through that rubbermaid bin. Feeling full of emotions, good, bad, and confusing. 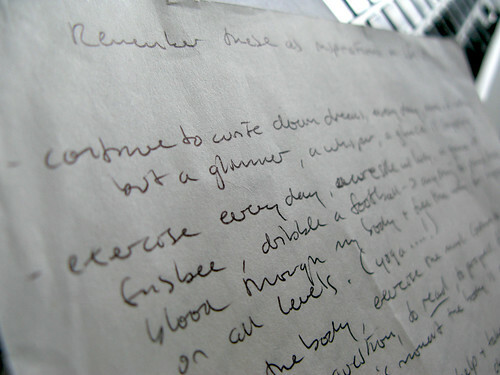 Well, those emotions have every right to be inside me, but at least now I’ve written them down and I feel free. And grounded, somehow, at the same time. Can we be grounded and free? Is being grounded also being free? In seven years every cell in your body is replaced but your mind continues to accumulate wisdom . Glad you can be reflective enough to recognise the value of past experiences whilst being fully in the moment. Yes, Veronica, exactly. It’s all about THE MOMENT. Interesting that you’ve noted that every cell in our bodies is replaced in seven years. Many years ago I read about a writer’s research on the seven year cycle. He said that we grow in seven year cycles. We grow and learn, and as you mentioned, accumulate wisdom, for seven years. Then around seven years, we go through what he called a hesitancy. A hesitancy is when we seem to regress. When the whole one step forward, two steps back thing happens. A quiet, respectful child may suddenly become loud and disrespectful, for example. The reason for these hesitancies is that we need to make room for new growth. All the changes that have occurred over seven years are coming to fruition. In order to make room for drastic new progress, some qualities or skills must be (temporarily) lost. When the child loses her quiet manner, she is making room for new skills, such as more focus on school work or new confidence with sports. She will most likely regain her respectful nature over time. That is why it is called a hesitancy: the body must hesitate momentarily so that the body can change.